I once read a statement that I paraphrase freely here ‘if one spends time in Japan and walk in its gardens, one can’t help but be infected by the beauty’. This explains one-half of our inspiration. By a simple transposition of words, the same applies to Santa Fe, New Mexico. 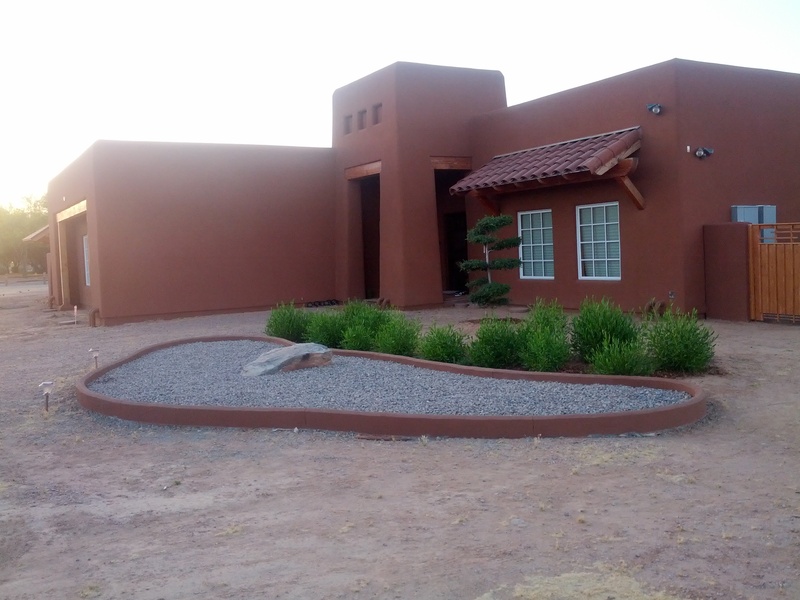 The Pueblo style and its native spirit and colors infect people in a similar way. These perspectives are reflected in the building, the street view is Santa Fe Pueblo and the inside experience is purely Japanese. Considered the most refined landscaping aesthetics, the Japanese garden building tradition goes back over a thousand of years. The first gardening manual, Sakuteiki (Notes on Garden Making) was written in the mid- to-late 11th Century. While modern gardens are essentially secular in orientation, some of the most impressive gardens in Japan are found in Buddhist temples and monasteries. The Zen and Pure Land Buddhism relationship with garden making became important references for us in this design. Healing and insightfulness are the two pathways of inspiration we followed. 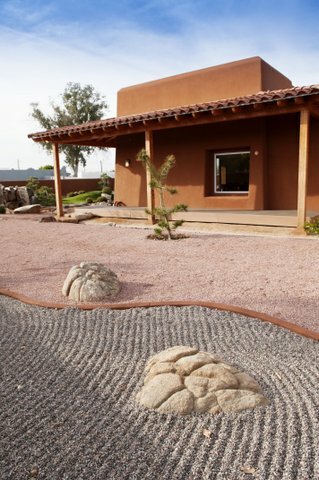 As the visitor enters a walkway built with large stepping stones leads by a dry (raked) garden which displays a large stone-carved Ohm symbol, the vibration of healing and connection with the divine. The walkway gradually reveals the different compositions in the garden: waterfall, quiet stones, water stream with a crossing path to the ‘pure land’ symbolically speaking, and meditation pathway. The various compositions in the garden are integrated to offer a large framed picture from inside the living room. The living (or grand) room, enclosed by Japanese Shoji doors, is the reference for the design. Following the modern notions of Sukyia Living—balanced inside/outside living and simplicity—the grand room is a multi-purpose room, simple and lightly decorated. Japanese gardens are built for quiet appreciation and respectful interaction with nature. Each composition in the garden is envisioned to represent the subtle harmony of natural environments, i.e. forests, mountains, meadows, rivers, and waterfalls. Most definitely the space is not designed for picnics and barbecues, and for children running around. The shrubs are visual elements styled (by hand) to represent boulders. The boulders are placed to represent their rolling down a hill a very long time ago. Every rock along the water stream is carefully placed to express the natural randomness of nature. The trees are sculpted to project old age and the effects of strong winds, much like the trees that grow from the hard rocks atop the peaks and mountains in the Grand Canyon and Sedona. The specimen trees are mostly evergreens, Aleppo pines in this case. The background trees are selected and planted to bloom in sequence as to extend the flower season. Pear trees bloom in the late seeks of winter, ashes show flowers in early spring, and jacarandas take their purple flowers until early summer. The chinese elms reserve themselves for the Fall when they produce a mantle of bright orange and yellow leaves. All in all the Japanese garden design communicates in profound perspectives the fleetingness and transiency of life. 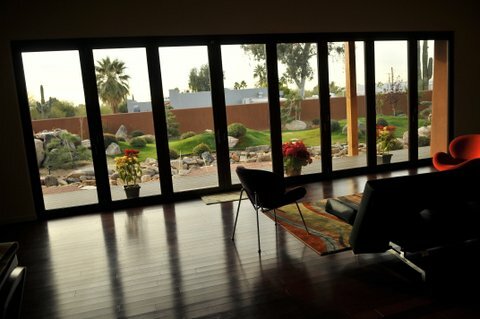 The Zen Garden (and hour home) has been conceived to become an alternative place for contemplative practices, spiritual search, and healing. Ours is a spirit of service and giving back to life. Stepping stones and Ohm sign have not been installed at the time of this writing (Feb 2014). As said elsewhere the garden is its early stages, it will reach maturity in 20 years. Be patient. This entry was posted in Zen Garden and tagged Zen Garden, buddhism, contemplative, meditation, healing, ohm, Japanese garden by John Zerio. Bookmark the permalink.